After it was hinted at by Treyarch, an enterprising group of Black Ops found the devilish secret hidden in Nuketown. The multiplayer map Nuketown in Black Ops pretty referential unto itself. Back in the 50s and 60s, there were fake towns like this set up in the deserts of the southwest in order to test the effectiveness of nuclear weapons. Such a place was even lampooned in Indiana Jones and the Kingdom of the Crystal Skull with the eponymous character attempting to hide in a refrigerator as a nuclear blast occurred around him. 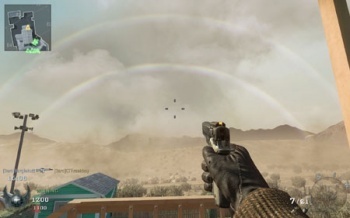 The Nuketown map in Black Ops is chock full of tongue-in-cheek humor, from mannequins set up as nuclear targets to a full-on double rainbow. In an interview, design director David Vonderhaar from Treyarch said that something would happen if you quickly dispatched all of the mannequins on the map, and, taking his advice, the website Next-Gen Tactics was able to unlock the secret for the first time yesterday. By shooting off the heads of every mannequin within fifteen seconds, a song starts to play over Nuketown's loudspeakers. It's a little hard to make out at first, because of the quiet nature of the first few bars, but it's unmistakably the Rolling Stone song Sympathy for the Devil. "Please allow me to introduce myself, I'm a man of wealth and taste." Check out how the Next-Gen team accomplished the feat in the video below. Love it or hate it, this installment of Call of Duty sure has a lot of videogame in-jokes and unlockable craziness. The team at Treyarch may not have figured out how to craft a single-player experience, but they are the masters of the easter egg.